Are you a Star Wars fan? St. Thomas University is holding a reading event for all students at the library the 28th of October until the 1st of November. The concept of the event is to try to inspire students at St. Thomas to participate in reading more books from different authors. The students will also have the opportunity to go to the movies and play a character in a play at St. Thomas. Star Wars: Verily, A New Hope is the tile of the book for this semester, and “Shakespeare” is the author. 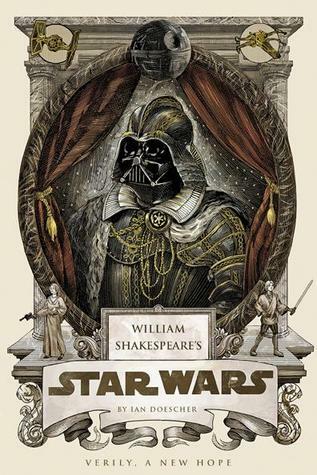 The title and the author of the book for the reading event this semester is “Star Wars” written by “Shakespeare”. The reason why this book was chosen was because people are familiar with the film Star Wars, it is a book that is fun to read, and every teenager or adult has probably watched the movies at least once. The book will also help the students to learn more about Shakespeare and his style of writing. The book also contains a lot of good information, for example culture and religion. To attract students to join the Bobcat Read celebration, the University Library is organizing events on the book, including a film viewing and a play where students can participate and take on the role of one of the characters from Shakespeare’s Star Wars . Lauren Lightfoot, one of the students at St. Thomas, says that this is a great opportunity to learn a lot about different books, cultures, and getting more knowledge on everyday life. The reading week, combined with the events held by the Library, is really fun and is a great opportunity to interact with people, make friends, participate in a play, and go to movies. She says that she did not like reading books before but has joined in the Bobcat Read events for the last 3 years. The Instructional Coordinator at the St. Thomas University Library, Lawrence Treadwell, says that “Bobcat Read Week” has received many good responses from students and other participants at the University. He says, “Most people have told us that they think it was fun, and I have seen many familiar students participate for many of the events we have held. It makes us very happy that so many students like the concept. We started this event 10 years ago, and we hold an event combined with a book one time per semester.” The previous titles for Bobcat Read have included The Hunger Games, The Devil Wears Prada, The Hobbit, and The Kite Runner. The Library’s staff have many ideas for how this upcoming book event. The events will be the 28th of October until the 1st of November. Professors will be invited to speak and students to present projects and take part in a dramatic play where they can be a little childish and live the part of a Star Wars action hero. Ariel Listo, is an eager student who has a passion for Star Wars and has a huge collection that includes all the movies and action figures. He thinks it is cool that the book’s title includes Star Wars, and is very excited to participate as in the play. Bobcat Read Week is an inspirational event where students can get involved with reading books, interacting with each other, and socialize through events, such as movies and plays. These reading events are popular amongst students and people of all ages are joining every year. The administrators at the library at St. Thomas are surprised by the good feedback they received from most of the students who participate in these events. Many students have changed their opinions about books. Every person has an inner child that wants to be reborn. If you are a Star Wars fan, and dream about being one of the heroes in this world, then you should join the event. Find your inner child and pretend you are one of the heroes in the Star Wars movie out to save the universe. The events will take place at the library at St. Thomas University during the week of October 28 until the 1st of November. All are welcome to join. Here’s what’s happening at the Library…. We’re getting ready for another great series of Bobcat Read Events. This Fall’s Bobcat Read selection is William Shakespeare’s Star Wars: Verily, A New Hope by Ian Doescher. Inspired by one of the greatest creative minds in the English language-and William Shakespeare-here is an officially licensed retelling of George Lucas’s epic Star Wars in the style of the immortal Bard of Avon. The saga of a wise (Jedi) knight and an evil (Sith) lord, of a beautiful princess held captive and a young hero coming of age, Star Wars abounds with all the valor and villainy of Shakespeare’s greatest plays. ’Tis a tale told by fretful droids, full of faithful Wookiees and fearsome Stormtroopers, signifying…pretty much everything. Stay tuned for more on Bobcat Read in the coming weeks! You can also check out books from our latest display, inspired by the much talked about 14 Books to Read Before They Hit The Big Screen list on BuzzFeed. Preview the selections on the Library’s Pinterest board. Hey Bobcats! Hope you’re having a great summer! At the University Library, we’re getting ready to make sure you have a great Fall term as well by bringing you new resources–databases, e-books, and more–to help you find the information you need to succeed in class. You can find the South Florida Business Journal and more on the library’s A-Z e-Research listing. We’re also finding new ways to connect with you! Facebook for the latest news and updates on library hours, events, and more. Check out our Pinterest boards to see what we have to offer. And tweet us your questions @STULibrary or follow us for updates. With the start of the new semester, we’d like to remind you of the library’s mobility. What? You check your bank account, find restaurants and look up movie times on your mobile phone, but you’d never thought of using your phone to use the library? 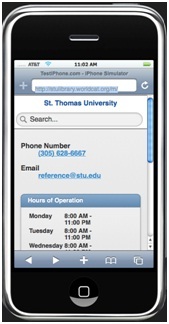 All print materials and DVDs available from St. Thomas University Library are now searchable through your mobile phone, complete with availability information and call numbers. 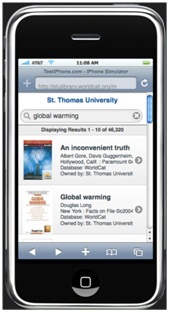 And soon you’ll be seeing links to online resources like journals, scholarly articles and eBooks, too. Just need the hours? Right there on top. Faster to call or e-mail about an item? The phone number and email address is front and center. Now you can be productive no matter where you are—waiting in line, waiting for a class to start, waiting for a professor’s office hours—you can decide what materials you’d like to explore further at the library and make best use of your time when you’re physically on campus and in the library. You can even e-mail yourself the citation for an item, so you won’t ever be stuck at the last minute with an incomplete “Works Cited” page for your paper. The mobile service is still fairly new for us and we’d love to hear how it’s working for you. Please use the feedback button on the site itself to let the developers know what you think! The Spring semester is well under way and the faculty and staff at the STU library are here to help you with your research needs. 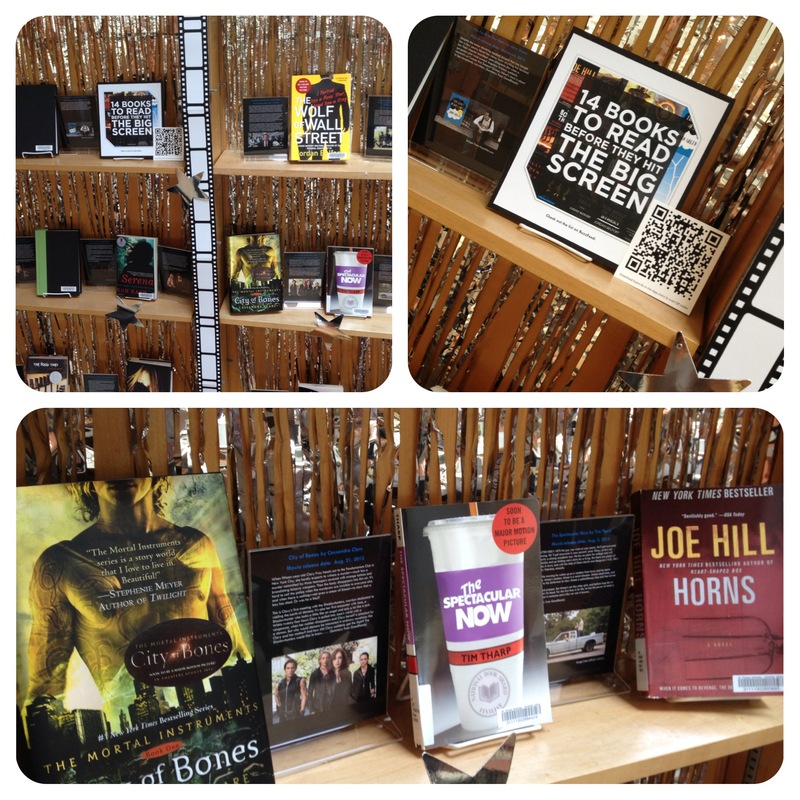 Stop by and check out the latest New York Times bestsellers in Fiction and Non-Fiction, and our display of books on film, education, and language. The library will be hosting its first event of the semester tomorrow night, January 20 at 5 pm in the Convocation Hall. Join the STU School of Ministry and Theology for An Evening of Fellowship with Tom Cordaro. This event will be streamed online here. Come visit the library and check out our festive Christmas display! While you’re here, take the time to browse our selection of Health and Wellness resources, on display in the library atrium until December 10th. Welcome to the new, St. Thomas University library blog. This blog will serve as a site for library news, event announcements, and general updates.